Posted on April 30, 2015 by Hawaii's Local Buzz. If you enjoy a good glass of whiskey, there’s only one thing better — pairing your whiskey with delicious chocolate, and perhaps some espresso. Scotch whisky is aged in oak barrels, which gives it complex flavors and subtle nuances that the chocolate helps accentuate. Other whiskies are also delightful when paired with various chocolate treats. Here’s a look at a few scrumptious whiskey and chocolate pairings to serve at your next party, or enjoy with your partner as you wind down after a long evening. Smoky whisky has sweet undertones, and bitter dark chocolate can help enhance these subtle flavors. Our dark chocolate-covered macadamia nuts would be delicious to enjoy with a glass of smoky whisky. For an even bolder taste, try our chocolate covered coffee bean crunch. The coffee flavor will add another element to the equation and really stun your taste buds. If you enjoy a good blended Scotch, try pairing it with a sweeter chocolate treat, such as our white chocolate cinnamon bun flavored coffee bean crunch. The sweetness in the chocolate will allow you to detect the more subtle, aged flavors in the Scotch. 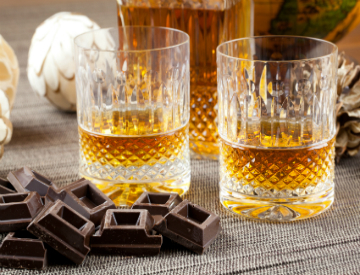 Try serving whiskey and chocolate as the dessert course at your next party. Offer several types of whiskey and several types of chocolate, and list pairing suggestions on little cards. Experiment with different combinations to see which you like best, and encourage your guests to do the same. May 16th is World Whisky Day — can’t think of a better excuse to have a Whisky & Chocolate pairing party! Hawaii’s Local Buzz is proud to offer high-quality a wide range of chocolate covered Hawaiian goodies. Visit us for more information about our chocolate covered coffee bean crunch, chocolate covered macadamia nuts, and other delicious, organic treats.